Sharing easy and doable tips for remodeling a home, inspired by the hit HGTV show, Fixer Upper! There’s something about home renovation shows that makes them so addicting. It’s fun to see what other homeowners are doing with their space to imagine what you could do with your own. Without shows to give you inspiration, those who aren’t inclined to the same creativity that pulses through interior decorators would be a little lost. The catch is that if a home makeover or renovation looks too difficult or extreme, it’s not as engaging as it should be. That’s where Fixer Upper comes in. Chip and Joanna Gaines have created a polished and homey look that anyone can replicate if they’re looking for a project. Before you start renovating your home, read on for a list of things Fixer Upper teaches us about remodeling a home. 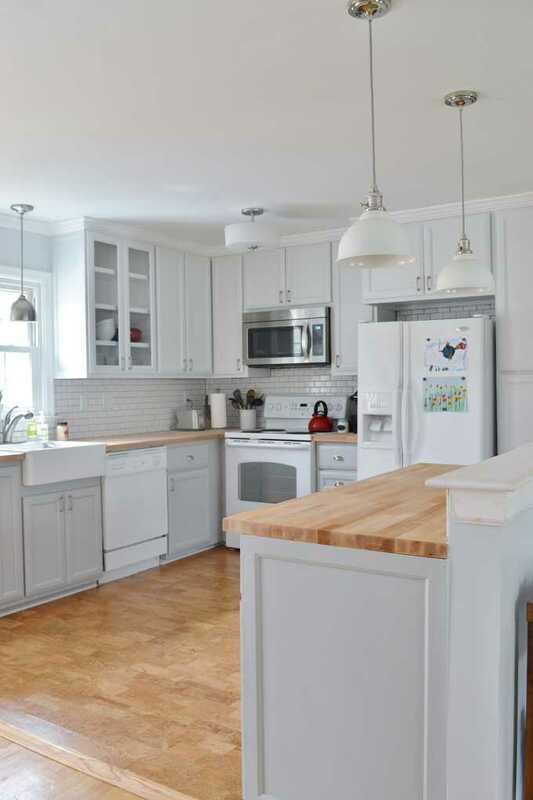 It’s best to know the most important lessons you can learn from the homes that are worked on in the show before launching a major renovation project of your own. Some parts of a home get taken for granted, and the ceiling counts as one of them. You never look up at it unless a fan needs dusting, but it can easily be the centerpiece of the room that you’re looking for. Redo your ceiling by installing wooden paneling, repainting or scraping if you have a popcorn ceiling. You don’t need a big project to make it stand out. A different paint color could be what you’re looking for to bring new life into your home. 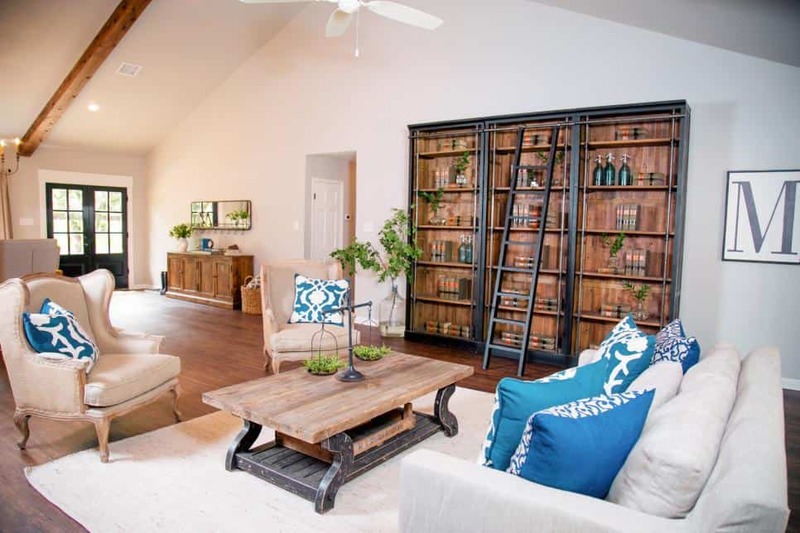 There’s a certain feel that Fixer Upper puts into each room that gets worked on, and you might be struggling to pin down what creates that feeling. Look no further than the paint colors! Lighter paint colors are always chosen because they make accents pop in any room. Aim for creams and neutrals to help set the right tone for your space. Looking for color palettes to try other than gray and white? There are plenty of other great options! As a homeowner, you’re buying, fixing and replacing things more often than you ever did in a rental space, so it’s easy to forget about the care your roof needs. Use this renovation time to touch it up with different materials. Your home will look brand new, and a replacement could add $12,000 to your home’s value. If you’re looking to sell, the roof is a good place to start to get the most for your money. Fixer Upper weaves a country vibe into all their renovations and remodeling, so think about adding some country to your home with a sliding barn door. Even if you don’t use it, barn doors easily work as a statement in interior design. Install one as a room divider or accent piece, whichever would work best. There cannot be enough emphasis on the importance of natural lighting in the home. Lighting changes everything from how paint colors look on your wall to the mood of a room. Draw back curtains and hang them high to allow more natural lighting into your home. Any space that gets this treatment will seem more open and light, like the rooms shown on Fixer Upper. You may only use your outdoor spaces for a few months out of the year, but they’re just as much a part of your home as any other room. Invest in long tables with multiple chairs so that anyone who walks out on your back porch or patio feels welcome. Large dining sets and centerpieces will help fill the space that’s created by an open area. 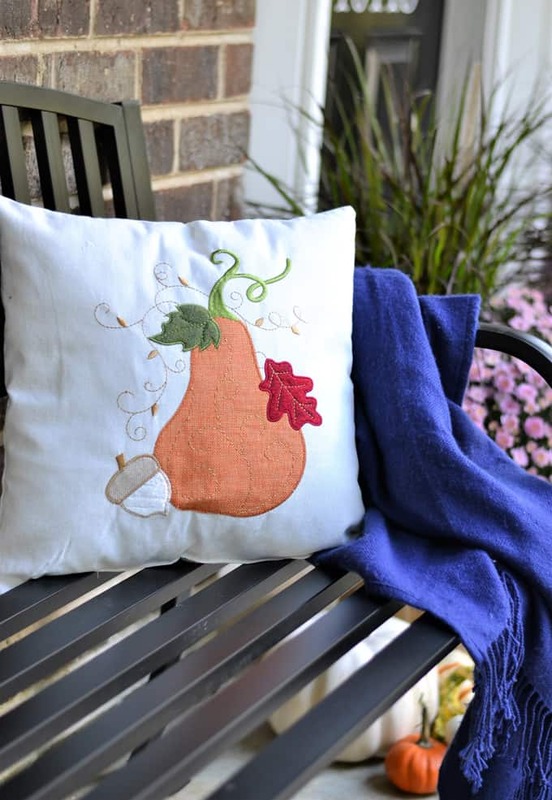 We have some easy fall porch decorating tips here! 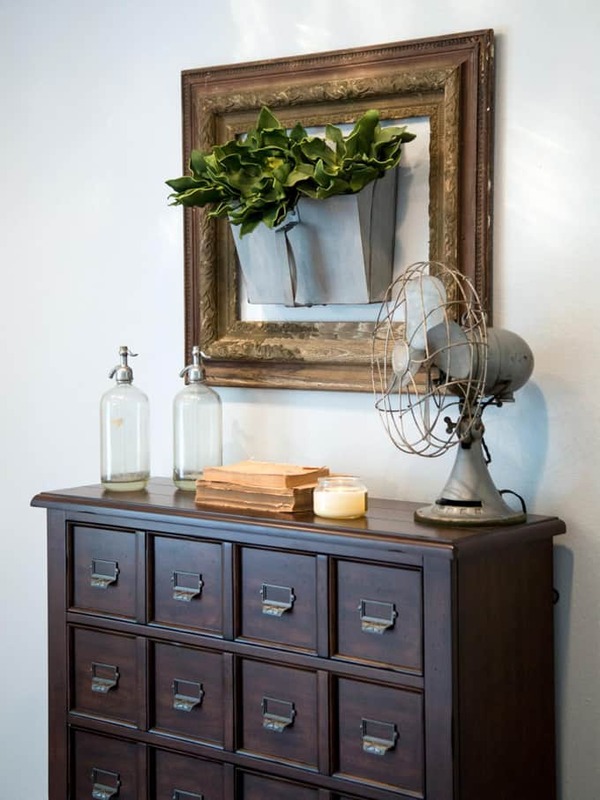 Rustic vibes and farmhouse decor go hand in hand, so they’ll work well if you’re hoping to draw the Fixer Upper look into your home. Shop around to see if there are any metal bed frames or steel accent pieces. Metal chandeliers could also create rustic romance in a room if the space is then warmed up by lighter colors and soft fabrics. You may have bought your home the way it is, but that doesn’t mean it has to stay that way forever. Get a professional to come visit your home and inspect the walls you could potentially take out. 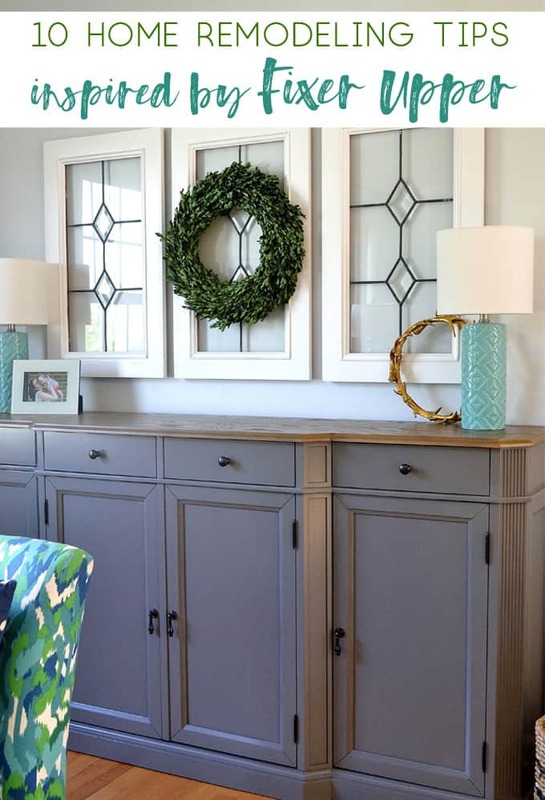 Opening up rooms is something that happens on Fixer Upper all the time, and it’s a possibility in your home as well. We did something similar for our gray and white kitchen makeover! When you set the table for a dinner party, it wouldn’t be complete if you didn’t have the right centerpiece. Rooms work the same way, so design around what you love. Use bedding for the focal point of a bedroom or curtains for a living room. Pull colors and textures out of them to work whatever room they’re in around what you love about that piece. A renovation or remodeling has one goal, and that’s to try and make your home feel more like home. It’s that feeling you get when you walk through the door at the end of a long day, look around where you live and feel the stress roll off your shoulders. To get that feeling in any room you want to work on, focusing on comfort will be the key that pulls your whole project off. Whatever you add or change should make a room easy to relax in. 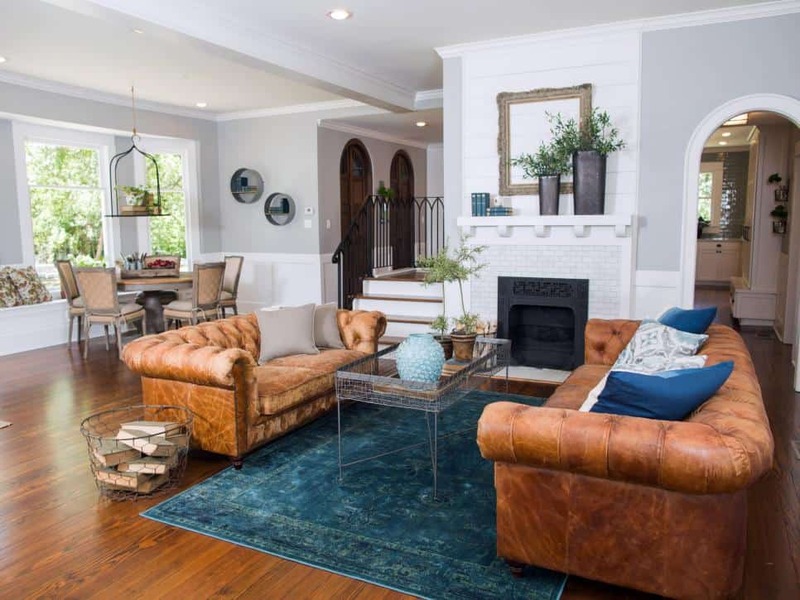 Fixer Upper achieves this goal with neutral colors and clean lines, so it feels like everything has a place. If your project is going to make your home cozier, you’re on the right path. Fixer Upper is an inspiring show, so you may be feeling like you need to start a project in your own home too. Try to work some of these tips into whatever you plan on doing to get the same vibes in your home that you get from seeing the designs on the show. Go with your gut to figure out what’s right, and your remodeling efforts will make everything fall into place. Thanks for reading our 10 Things Fixer Upper Teaches Us About Remodeling a Home. Have a lovely day! Kacey Bradley is the lifestyle and travel blogger for The Drifter Collective, an eclectic lifestyle blog that expresses various forms of style through the influence of culture and the world around us. Kacey graduated with a degree in Communications while working for a lifestyle magazine. She has been able to fully embrace herself with the knowledge of nature, the power of exploring other locations and cultures, all while portraying her love for the world around her through her visually pleasing, culturally embracing and inspiring posts. 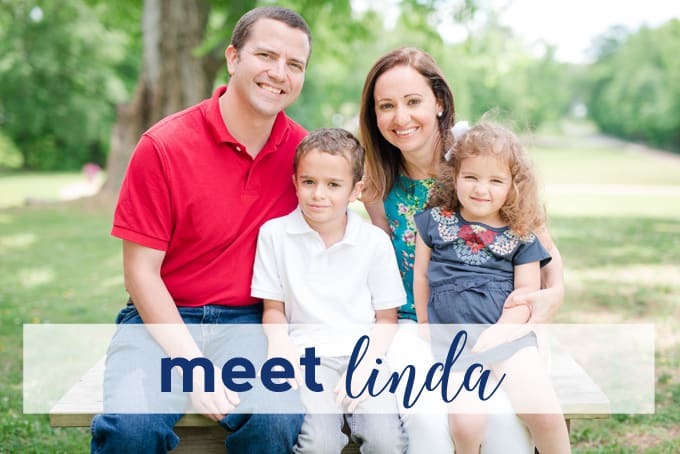 Along with writing for her blog, she frequently writes for sites like US Travel News, Thought Catalog, Style Me Pretty, Tripping.com and more! This blog truly inspired me to renovate my home! Thanks for sharing all these neat ideas. I’m glad I stumbled upon it. I’ll bookmark your site for future reference.